May buy 10 for yourself and 10 additional as gifts. Valid only for option purchased. Must be 7 or older for Haunted Heights. Children under 3 years old are free. Must sign waiver; 17 and younger must have guardian-signed waiver. Closed-toe shoes are preferred. All equipment included. Winter attire recommended. Valid only for listed dates and times. Reservations aren't required for hay day. Valid through: Oct 31, 2015. See the terms that apply to all deals. The Hay Day attraction include wagon rides, a haunted forest maze, face painting, a food tent, games, and a small zoo with painted horses, bison, and other animals. The event takes place from 6pm to 10pm on October 30-31. 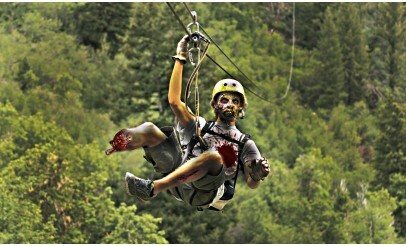 Or, dare to take part in the Haunted Heights Zipline! Gear is provided and guides are there to help and instruct. Adventure Zipline is Utah's premier, tree-top canopy zipline tour, located just 7 minutes from the mouth of Provo Canyon. You'll experience breath taking mountain scenery, beautiful river-front landscapes, and mountain fresh air with the zipline being nestled in the Wasatch Mountains and next to the world famous Provo River. Get ready to take the ride of your life!